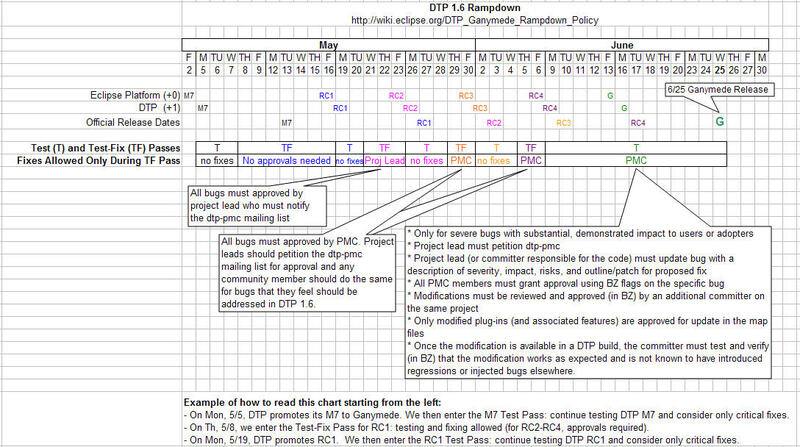 This document defines a set of rampdown cycles for DTP 1.6. The goal is to ensure that DTP stability and completeness converges on the 1.6 release dates, while allowing mechanisms for changes as necessary. Since this document is about the rampdown, only cycles post DTP 1.6RC0 will be detailed below. Since DTP 1.6 uses map files, committers can continue to deliver changes to CVS HEAD, and such changes are not automatically included in the build. Thus, this process concerns approved updates to the map files and hence changes to the code delivered by DTP 1.6. Given that any plug-in might need to be changed during the end game, the DTP PMC discourages substantial changes being released to CVS HEAD, which could then complicate the process of promoting only tightly constrained changes to the DTP 1.6 release stream through the map files. A period of testing during which no changes are made to the DTP code line, unless approved by the PMC. Nightly builds will not be produced during this pass. In general, we ask everyone in the DTP community to test the target build as thoroughly as possible. A Testing Pass including bug fixes based on the approval policies described below. Nightly build will be produced during this period as necessary to make bug fixes available to the DTP community. During the test/fix phase for RC1 and RC2, we will do regular daily builds. In test/fix phases for RC3 and RC4, where PMC approvals are needed, we will not build nightly, but will build as needed (5/29 and beyond). In an attempt to to avoid last-minute regressions, we are implementing a slightly longer testing cycle for the M7/RC0 milestone. 1. Commits for DTP 1.6 M7 will be allowed through the build start time (5am Shanghai time as noted at http://wiki.eclipse.org/DTP_Build_Transition) on Tuesday, April 29th by 1:30pm PST. 2. The testing period will start April 30 and last through May 2 so we are ready to push a build to the Ganymede site on May 5. Document the severity and impact of the bug, i.e. why should this be included in the milestone at such a late date? If a change meets all of these criteria, it can be delivered and we will continue testing with the next build that includes that fix. If you have any questions about this policy, please send them to the dtp mailing lists (dtp-pmc or dtp-dev). From Thursday, 5/8, through Friday, 5/16: Testing & Fix Pass: Standard DTP policies apply. From Wednesday, 5/21, through Friday, 5/23: Testing & Fix Pass: All bugs must approved by project lead who must notify the dtp-pmc mailing list. From Thursday, 5/29, through Friday, 5/30: Testing & Fix Pass: All bugs must approved by PMC. Project leads should petition the dtp-pmc mailing list for approval and any community member should do the same for bugs that they feel should be addressed in DTP 1.6. From Thursday, 6/5, through Friday, 6/6: Testing & Fix Pass: All bugs must approved by PMC. Project leads should petition the dtp-pmc mailing list for approval and any community member should do the same for bugs that they feel should be addressed in DTP 1.6. Once the modification is available in a DTP build, the committer must test and verify (in BZ) that the modification works as expected and is not known to have introduced regressions or injected bugs elsewhere. Additional RC builds will be scheduled as necessary. This page was last modified 17:52, 7 May 2008 by Linda Chan. Based on work by Brian Fitzpatrick, John Graham and John Graham.